Hospitals have been existing in one form or the other since time immemorial but there never had been so much concern about the waste generated by them. The implications of hospital wastes are manifold. Now hospital waste management is one of the thrust areas which are drawing attention of health authorities and also the government. 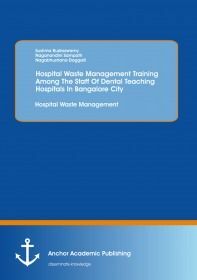 Hospital waste management requires commitment from persons at all the levels of the health care facility.The present interventional study was conducted to assess the knowledge, attitude and practice about hospital waste management and to provide training programme on hospital waste management for the staff and to assess the effect of training among the staff of dental teaching hospitals in Bangalore city. For the purpose of conducting this study cluster sampling procedure was adopted, and eight dental teaching hospitals were randomly selected.A specially prepared, and pre-tested structured questionnaire, was given to assess the knowledge, attitude and practices among the staff of dental teaching hospitals and collected personally. In each institution the following elements were studied using checklist i.e segregation, disinfection, disfigurement, containment, colour coding, personal protective equipment, in house transport and disposal. One day training programme on the hospital waste management was organized at each dental college. Training was given in English to the Dentist and Dental Auxiliary and the local (Kannada) language for the Attenders. Learning media used was Audiovisual Aid- LCD projector. The duration of training per each cadre was for one and half hour which was interactive, participatory and task focused. Two months after initial training, the same baseline questionnaire was administered to the staff i.e. Dentist, Dental Auxillary and Attenders and monitoring of the waste management practices was done using the same check list, used earlier. Intervention was evaluated by assessing improvements in their knowledge, attitude and practice scores after intervention in comparison to the base line scores. This comparison involved mean and percentage changes in their knowledge, attitude and practice on the hospital waste management. Appropriate statistical tests were used to analyze the data.177 dentists, 19 auxiliaries and 54 attenders completed the study. Two months after intervention 24.4% improvement in knowledge was found among the dentists, 18.7% improvements among auxiliaries and 23.3% improvements (p<0.001, significant) among the attenders when compared to the baseline knowledge. Change in attitude was 36.2% change among the dentists, 33.3% among auxiliaries, and 56.42% among the attenders (p<0.001, significant) when compared to the baseline attitude. Change in practice was 17.6% among the dentists, 16.4 % among auxiliaries, and 4.4 % among the attenders when compared to the baseline practice. The findings of this study suggest that a training programme increases the knowledge as well as the sense of responsibility resulting in change in attitude and practices.